– World’s fastest full-frame DSLR with new Dual DIGIC 5+ processor aims to conquer the professional market. 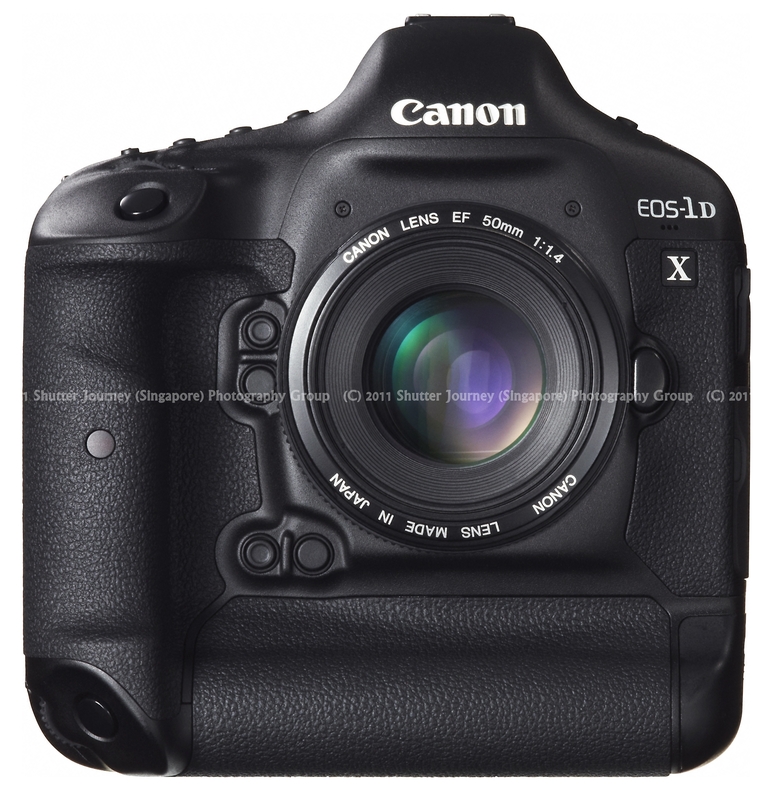 Singapore, 18 October, 2011 – Canon today announces the launch of the new EOS-1D X, the ultimate professional Digital SLR (DSLR) camera designed to support any photographic application and all shooting demands. 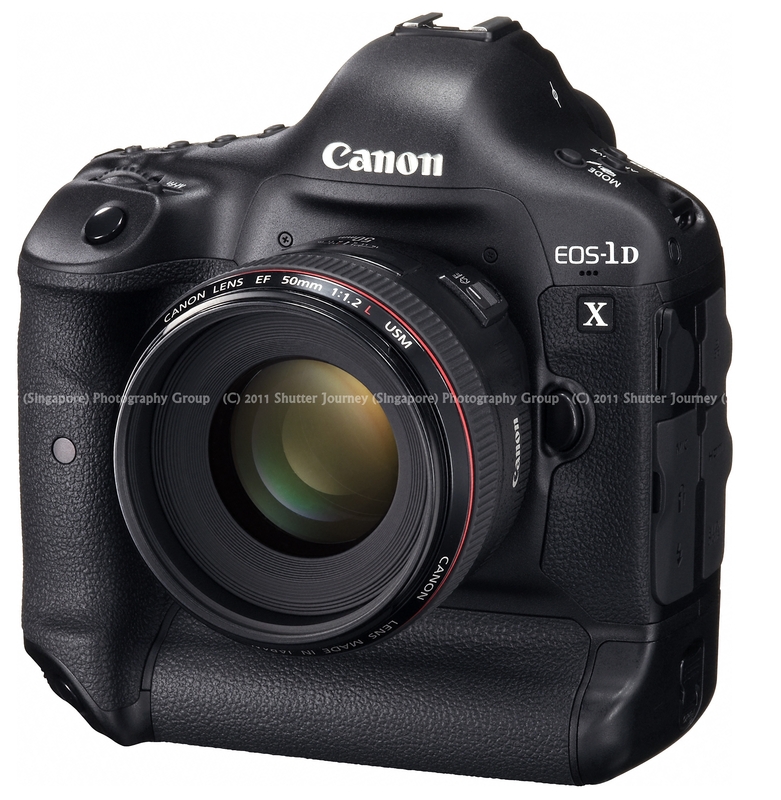 Technological evolution in the EOS-1D X takes a giant leap forward from the EOS-1Ds Mark III and EOS-1D Mark IV. Marrying and improving on the class-leading features of its twin sources of inspiration, the EOS-1D X sports a full-frame 35mm 18.1-megapixel CMOS sensor with a shooting speed of up to 14 frames per second (fps), powered by the brand new Dual DIGIC 5+ image processor. Developed based on careful research on the needs of professional photographers around the world, the EOS-1D X expands the realm of photographic possibilities by bringing high image quality and high continuous shooting speeds together, two crucial points of photography traditionally kept separate. The EOS-1D X’s new 35mm full-frame CMOS sensor has approximately 18.1 effective megapixels featuring a superior signal-to-noise (S/N) ratio and a larger pixel size of 6.95μm square pixels, as compared to the EOS-1D Mark IV’s 5.7μm square pixels. The larger pixel and sensor size enhance light gathering efficiency and faithfully capture the mood of the original scene with minimal noise. Seventeen times faster than the DIGIC 4 processor used in the current EOS series, the all-new Dual DIGIC 5+ processor in the EOS-1D X boasts ultra high speed processing to produce unprecedented image quality even at high ISO settings and shooting speeds. Representing a two-stop improvement in noise reduction, images shot at ISO 51,200 using the EOS-1D X are comparable to ISO 12,800 images shot with the EOS-1D Mark IV. Standard ISO settings have increased by 2 stops, up to ISO 51,200, compared to ISO 12,800 with the EOS-1D Mark IV. This can be further expanded up to ISO 204,800. With such a wide range of ISO settings, professionals can now eliminate motion blur in almost any kind of situations and yet achieve ultra low noise quality. -1D X’s imaging capabilities include real-time chromatic aberration correction, in-camera RAW processing, lens distortion correction (using in-camera RAW processing) and multiple exposures. The EOS-1D X offers instant response to match sports photographers’ reflexes with the minimum shutter-release lag reduced to 36 milliseconds (from 40 milliseconds in the EOS-1D Mark IV). In the One-Shot AF and AI Servo AF modes, a maximum continuous shooting speed of 12fps is attainable with ISO speeds of 25,600 and below. Photographers also have the option to activate the super high-speed continuous shooting mode of 14fps. The EOS-1D X also uses a new mirror mechanism, the Quad Active Mirror Stopper. Equipped with separate bounce lock mechanisms and double balancers, the mechanism reduces mirror bounce instantly, and enables a stable yet precise high-speed drive to ensure photographers will never miss any high-speed action. The EOS-1D X features a next-generation Auto Focus (AF) system, sporting a 61 point high-density reticular AF (41 cross-type points) that offers wide, auto focus coverage at high precision as well as enhanced subject tracking capability. The EOS-1D Mark IV utilizes 39 f/2.8-sensitive cross-type sensors, which are only maximized to help the user achieve faster AF when lenses have an aperture of f/2.8 or brighter. This feature is enhanced in the EOS-1D X by utilizing 41 f/4.0-sensitive cross-type sensors. Professionals can now use f/4.0 lenses to achieve the same AF speed compared to an f/2.8 lens on the EOS-1D Mark IV. This is also applicable even with an f/2.8 lens attached to a 1.4X extender (making an effective aperture value of f/4.0) – these 41 cross-type sensors will be usable as well. For f/2.8 lenses, there are 5 dual cross-type sensors in the centre that allow ultra high precision AF, exceeding previous EOS-1D series models. 21 cross-type sensors in the middle are f/5.6-sensitive, giving the EOS-1D X dramatically expanded focusing accuracy to support a larger range of f/4.0 and f/5.6 lenses. At the heart of the new AF unit is the new EOS iSA (Intelligent Subject Analysis) System that employs a 100,000-pixel RGB Metering Sensor and AE-dedicated DIGIC 4 image processor. This innovation recognizes a subject’s color and face, in addition to movement, to make Intelligent Tracking and Recognition (iTR) possible, offering reliable and continuous tracking of the subject. These two technologies work in tandem to deliver better focusing capability in lower light. Already highly regarded for its high-quality images, low noise and cinematic look, EOS Movie technology takes another leap forward in the EOS-1D X. With the new Dual DIGIC 5+ processor, color artifacts and moiré that appear in scenes (with fine horizontal lines) are drastically reduced, producing industry-grade images with low noise, even at high ISO speeds. New EOS Movie features in the EOS-1D X include SMTPE-compliant time code embedding, manually adjustable audio recording level settings and recording in P, Av, Tv and Manual modes. 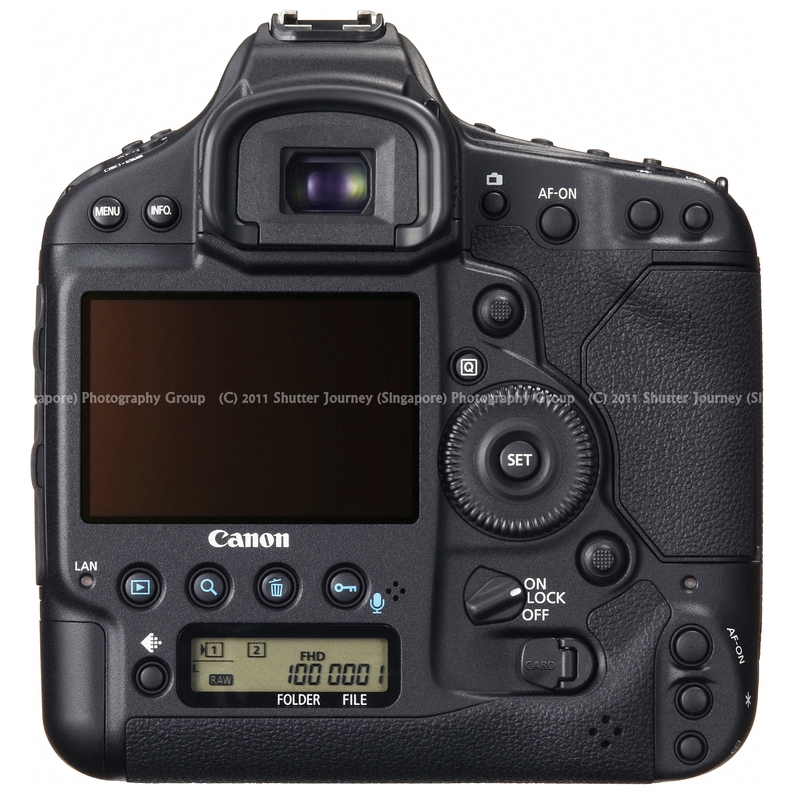 Immediate recording is also possible through the use of user-customizable function buttons on the EOS-1D X. Users are also able to select between ALL-I and IPB compression methods to suit their preferred post-production workflows. ALL-I compression results in larger file sizes but is ideal for speedy conversion during the editing process as individual frames are not linked to each other. IPB compression not only offers higher compression for smaller file sizes, it also offers image quality similar to previous versions of EOS Movie. To meet professional demand for long takes and synchronizing multiple videos, video file sizes that exceed 4GB (FAT specifications) are automatically split. A new file is automatically created while recording continues without any interruption. The EOS-1D X uses a completely new shutter unit featuring carbon fibre shutter blades that are lightweight and more rigid, with a life-span of up to 400,000 cycles assured. Also new to the EOS-1D series is the electronic curtain shutter, for a quieter operation during live view shooting. With a robust magnesium alloy body, the EOS-1D X features a dust-proof and drip-proof design to meet the high demands presented by the most grueling of shooting conditions. A new dust removal system, Ultra Wave Motion Cleaning, makes use of two vibrating elements in a carrier wave system to effectively remove small particles from the sensor. Frequently used controls like control dials have also been redesigned with non-contact rotation detection systems to reduce wear and tear. 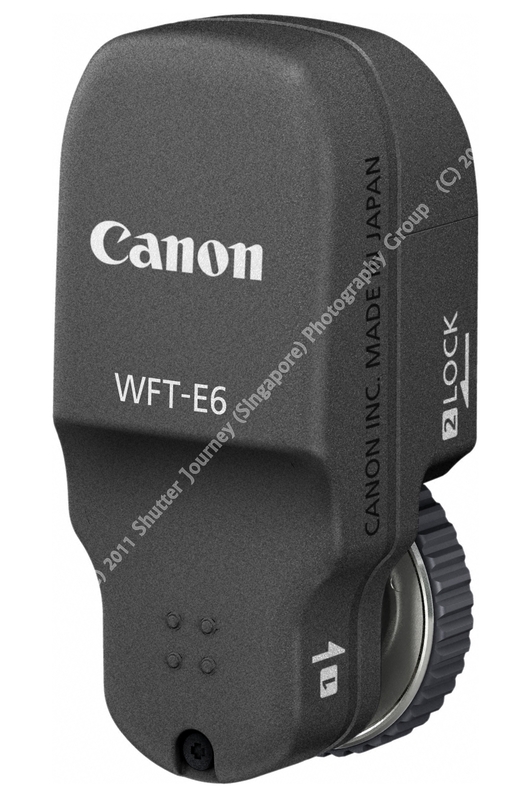 Accompanying the EOS-1D X are two new accessories to further expand the professional EOS System: the WFT-E6 wireless file transmitter and GP-E1 GPS receiver. For image transfers up to three times faster than conventional wireless methods, the EOS-1D X coupled with the WFT-E6 dedicated wireless file transmitter is compatible with wireless LAN IEEE802.11n. The WFT-E6 is more compact and lightweight than the WFT-E2 II, while sporting dustproof and water resistance performance equivalent to the EOS-1D X. With the Wireless Time Syncing function, up to 10 units of EOS-1D X can be synced. 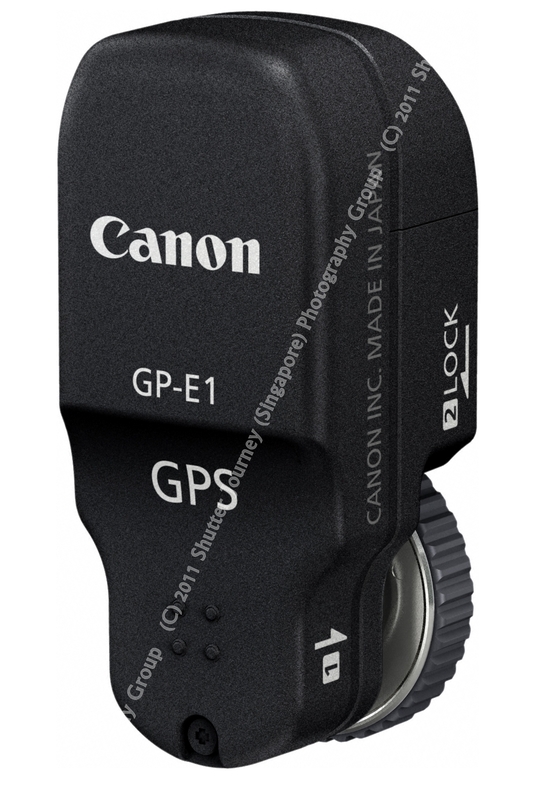 The GP-E1 is a compact GPS receiver that automatically adds location information to the EXIF data of images shot by the EOS-1D X. A dedicated map application will also ship with the GP-E1, allowing users to reference shooting locations with ease. 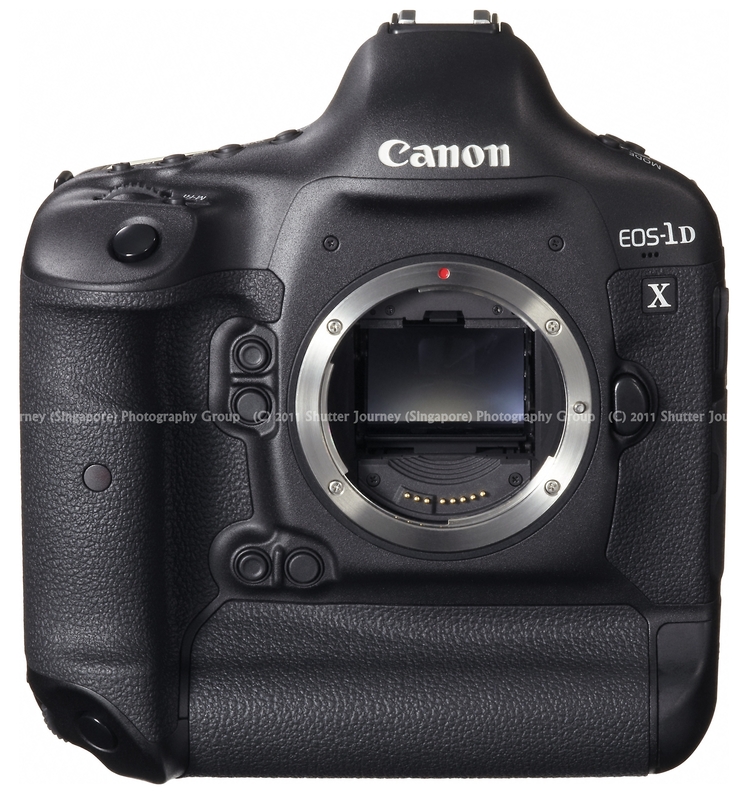 Price and availability of the EOS-1D X will be announced at a later date. The new EOS 1Dx will lure Professionals who had jumped ship to Nikon for the Nikon D3S back to Canon. From the press photos, the profile of the 1 series remains somewhat similar and when compared to the 1DMark IV, slight differences are noted on the button arrangement on the back and the front remains very much the same with the earlier models running in the Canon Professional line. This long awaited release by Canon had long been predicted since Nikon had successfully combined high shutter speed with high resolution seen in the D3S. As expected, Canon had improved and “upgraded” the specifications to compete the Nikon monster with the new EOS 1DX – only better with faster speed, better resolution and more goodies packed into a shooting Goliath. Having used the EOS 1Ds Mark III & a current owner of a EOS 1D Mark IV, I see the EOS 1DX as a “Super upgrade”. As a professional, there were many times I needed both speed and resolution in my line of work, ended up lugging the EOS 1D Mark IV (for speed) together with another EOS5D MarkII (for resolution). The weight will eventually kill me. With the new EOS 1DX offering me both speed & resolution, this camera is the best testimonial that Canon finally listens to its users – especially Professionals like us that has to use 2 cameras (FF + Cropped) at most times. This entry was posted in Brand: Canon, Photography Articles & Videos, Uncategorized and tagged Canon, DSLR, EOS. Bookmark the permalink.